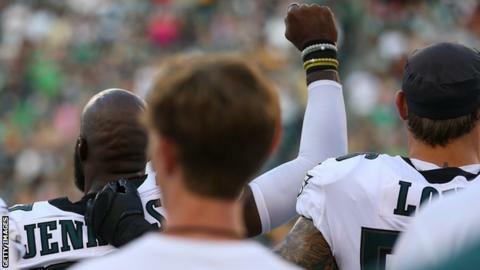 Philadelphia Eagles' Malcolm Jenkins and De'Vante Bausby raised a fist, as did San Francisco 49ers' Marquise Goodwin and Miami Dolphins' Robert Quinn, while his team-mates Kenny Stills and Albert Wilson kneeled. The NFL says it's anthem policy is on hold while it holds discussions with the NFL Players Association. Everybody's happy. The players continue to protest, and Trumpsters continue to be offended.